Prepare Basic Pizza Dough as directed below, adding crushed red pepper to flour. While dough is resting, lightly sauté onion, celery, and green pepper. Remove from heat. Microwave sausage in 1/2-inch of water, covered, for 4 to 6 minutes. Set aside. After dough is shaped, brush with 1 tablespoon oil. Sprinkle with one cup shredded mozzarella. Top with drained crushed tomatoes. 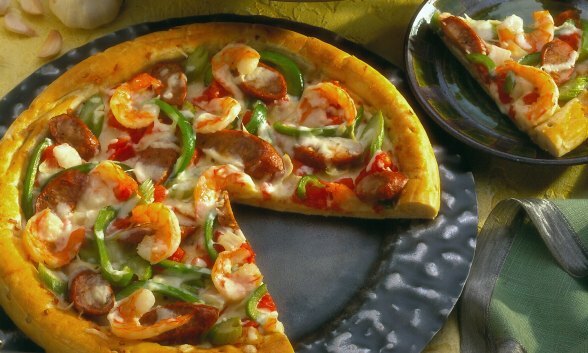 Arrange green pepper mixture, shrimp and drained sausage slices attractively. Top with remaining 1 cup mozzarella. Place loaded Pizzazz® baking pan on Pizzazz® rotating pizza oven and bake using the LOWER setting for 5 minutes. Finish on the DUAL setting for 15 minutes.